Mr. Baron’s career has included serving as lead trial counsel for the Justice Department in landmark litigation involving the preservation of White House emails, and being appointed as the first Director of Litigation at the U.S. National Archives and Records Administration (NARA). 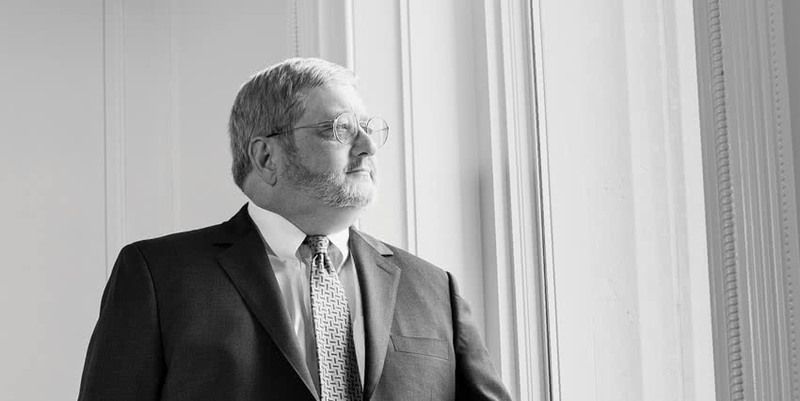 After spending 33 years in government service, in 2013 he joined the newly formed Information Governance and eDiscovery group at Drinker Biddle & Reath LLP and has been Chambers-ranked in eDiscovery for the past four years. A past co-chair of The Sedona Conference WG1 and past chair of the DC Bar’s Information Governance and eDiscovery Committee, Baron is currently co-chair of the Information Governance Initiative, a think tank and vendor consortium, and serves on the advisory boards of the Georgetown Advanced eDiscovery Institute and the Cardozo Data Law program. In 2013, Baron was named one of six “eDiscovery trailblazers” by The American Lawyer in its issue devoted to “The Top 50 Big Law Innovators of the Past 50 Years.” He is the first Federal lawyer (and only the second lawyer overall) to win the Emmett Leahy Award, given for lifetime achievements in support of the records and information management profession. Among his many other awards and commendations, in 2013 he was the recipient of the Justice Tom C. Clark Outstanding Government Lawyer award, which is given by the Federal Bar Association. and NPR’s All Things Considered—and has been interviewed by The New York Times, Washington Post, Wall St. Journal, TIME Magazine, and numerous other media outlets. Baron has written over 90 published pieces on eDiscovery and Information Governance-related topics, has served as an editor-in-chief on three Sedona Conference commentaries, co-taught the first eDiscovery course in the U.S. to graduate students obtaining PhDs and Master’s degrees in information science, and edited the 2016 ABA book, “Perspectives on Predictive Coding and Other Advanced Search Methods for the Legal Practitioner.” He continues to lecture around the U.S. and the world on novel and emerging IG issues of interest to the legal and records professions. We caught up with Baron while he was keynoting at an archivists’ conference in Edmonton, Alberta. 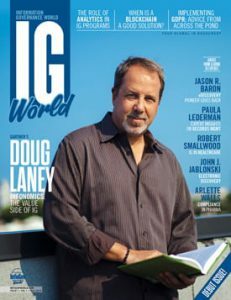 InfoGov World: You were an attorney working for the federal government. How did that lead to your pioneering work in eDiscovery? JRB: I agree with Malcolm Gladwell’s observation in his book “Outliers” that it takes 10,000 hours of hard work to really master anything. In my case, beginning in 1992, I spent seven years as lead counsel on what was known as the “PROFS” case (Armstrong v. Executive Office of the President), which originally involved whether emails exchanged among Lt. Col. Oliver North and other National Security Council staff caught up in the Iran-Contra scandal, and preserved on PROFS backup tapes, should be categorized as government records. The D.C. Circuit ruled that emails with certain attached metadata should be considered records; the case led to a settlement resulting in successive administrations permanently archiving all White House emails. This, in turn, has led to an ever-growing archive of at least a half-billion presidential record emails (to date) stored in NARA’s legal custody—all potentially subject to eDiscovery searches and other forms of access requests (e.g., under the Freedom of Information Act). It was in 2002, in my capacity as Director of Litigation at NARA, that the Justice Department in connection with U.S. v. Philip Morris (the RICO case filed against Big Tobacco) asked our agency to do a broad eDiscovery search for responsive Clinton-era emails. My shepherding of that early eDiscovery effort over six months, employing Boolean keyword searches, convinced me that lawyers would need more advanced tools if they were going to be expected to search vaster collections of digital objects in the future. And that recognition led me to seek out the brightest minds in computer science to help lawyers advance their knowledge of how to take advantage of artificial intelligence in the form of advanced search techniques. How has eDiscovery evolved in the last decade and a half with respect to the use of advanced search methods such as predictive coding and technology-assisted review? We really have come a very long way. Within a year of the 2006 adoption of changes to the Federal Rules of Civil Procedure, opinions authored by Judges John Facciola, Paul Grimm, and others cited to the 2007 Sedona Conference Commentary on Best Practices in Search and Information Retrieval—and to the TREC Legal Track research results—suggesting that lawyers can and should explore better alternatives to keyword searching. Judge Peck’s 2012 opinion in the da Silva Moore case—giving a “blessing” to the use of technology-assisted review (TAR) based in part on a seminal law review by Maura Grossman and Gordon Cormack involving data from the TREC Legal Track—served to further galvanize the eDiscovery community. This led to what is today a cottage industry of case law on the subject of the proper use of TAR methods. In complex cases involving voluminous electronic records, eDiscovery lawyers who choose to use advanced search methods enjoy a tremendous strategic advantage in litigation: they are able to provide insight into large data sets for their clients, allowing the construction of a governing narrative in a fraction of the time it otherwise would have taken previously. Admittedly, not every piece of litigation involves a sufficient volume of evidence so as to make advanced search methods economically viable; but, in my view, any lawyer who chooses to put his or her head in the sand in failing to even consider weighing the pros and cons of using advanced search techniques in the appropriate case is simply not demonstrating professional competence in the use of technology consistent with ABA Model rules and emerging State Bar guidelines. 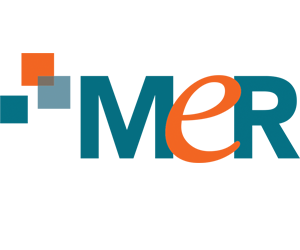 What advice or insights can you share with companies wishing to improve their eDiscovery processes? 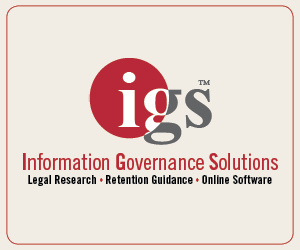 I would like to respond to your specific question by saying something about improving Information Governance more generally. There is no turning back in terms of the corporate need to keep up with an exponentially growing amount of information in digital form. If anything, the enactment of the General Data Protection Regulation (GDPR) has now put a worldwide spotlight on the responsibility of corporate entities to manage their data sets in ways that ensure greater compliance with privacy laws. That means more than simply updating record retention policies: as lawyers in this area, we need to provide technological solutions to categorizing and disposing of records and information streaming in to corporate networks in ways old and new, including increasingly from smart devices and the Internet of Things. Corporations can improve their specific eDiscovery process by stepping back to ask the question: How do we mature our overall handling and disposition of data generally? The weekly random cyberbreach scandal only serves to underscore the importance of asking a prior question. Why do we have this data in the first place? It also has become very clear that we are all living in an increasingly algorithmic world. EDiscovery lawyers practicing advanced search have a leg up in terms of already understanding the power of algorithms, as well as some inkling as to the potential for algorithmic bias. As part of any Information Governance program, the C-suite should be thinking of ways to escalate issues involving the use of algorithms of all kinds that may affect data collected on employees and customers. 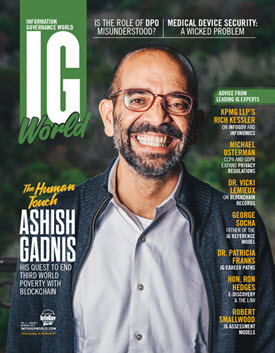 Only where there is intelligent discussion and greater transparency can organizations realistically expect to handle the governance and compliance challenges coming down the pike soon posed by Big Data. We’ve heard you are doing work in Cambodia as part of a nonprofit charity. Will you describe your efforts and the goals of the initiative? How much time do you have? (Laughs.) When my mom passed away in 2012 after suffering from MS for decades, she had been in the care of an institutional facility with extraordinary personal assistants. One of her main caregivers, a woman named Nan, hailed from a tiny village in southwestern Cambodia, about three hours south of Phnom Penh. In gratitude for her wonderful work, I made a pledge to Nan that I wished to do something to help the people, and particularly the children, of her home village. I was happy to fund the building of a library at the local high school and the distribution of school supplies in 2016. But when I went to Cambodia that first time to dedicate the library, I realized that the thousand kids who surrounded us at the local school lacked so much in the way of basic infrastructure: their school had no toilets, they had no clean water to drink, and many students didn’t have enough to eat—while being expected to walk up to 10 kilometers each way to school. And so I began The Chelly Foundation in my late mom’s name to help with the health and education of the children of Chumkuri District. And I am pleased to say we have been making a positive difference in the lives of many people through a variety of activities, including: building water and sanitation facilities, giving away books and school supplies, buying bicycles, supporting dental programs, building playgrounds, and much more. 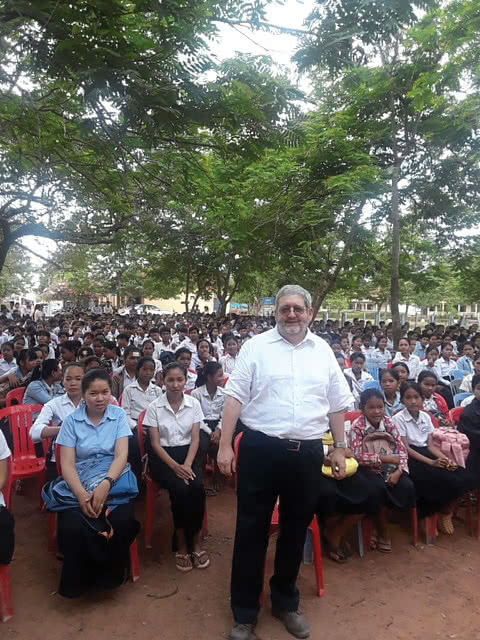 Our main emphasis has been to incentivize kids to study and pass their 12th grade national exams; and to that end we have now given 10 deserving students (eight young women and two young men) full four-year scholarships to the Royal University in Phnom Penh and similar institutions of higher learning (with four more to be granted this fall). We just finished the building of a Chelly House to serve the community—and are heavily involved in several sustainable agriculture projects that hopefully will provide a steady income stream to do even more for the children. At a high school dedication for The Chelly Library. Jason with four girls who received donated bicycles. 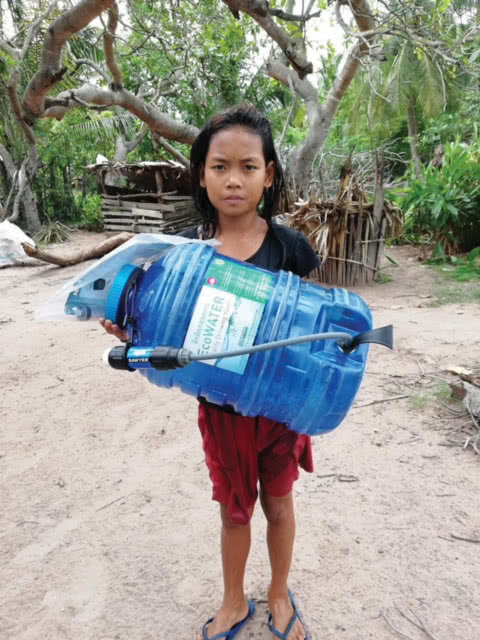 A girl holding a donated water tank with filter. Jason helping carrying school desks to a special bread day celebration hosted by his charity. Anyone wishing to know more about our work is invited to go to www.thechellyfoundation.org and to like us on Facebook: www.facebook.com/thechellyfoundation. We are a 501(c)(3) charity and all donations are tax deductible. Thank you for letting me talk about this!